Hot on the heels of their success with their Art Book and Mini Comic Collection, Dark Horse Comics are continuing to spoil He-Man & The Masters of the Universe fans the world over with their latest release, a complete guide to the He-Man and She-Ra Filmation animated adventures. Now, as you should expect by now from Dark Horse, when they say complete guide, they mean complete guide, with almost 600 pages packed with trivia, animation breakdowns and story synopses for every single published episode of both shows. Physically, this bad boy is the same pleasingly chunky size as the Art of He-Man & The Masters of the Universe hardcover, albeit almost twice as thick. It’s a hefty tome for sure, but considering the sheer wealth of fascinating knowledge packed into these pages, any less would be doing a major disservice to the source material. It’s worth emphasising now just utterly exhaustive a reference guide this is, containing all the usual things you’d expect from a summary of episodes – Title, Production Number, US and UK air dates, etc. – but also some far more interesting tidbits, particularly for MotU fans. 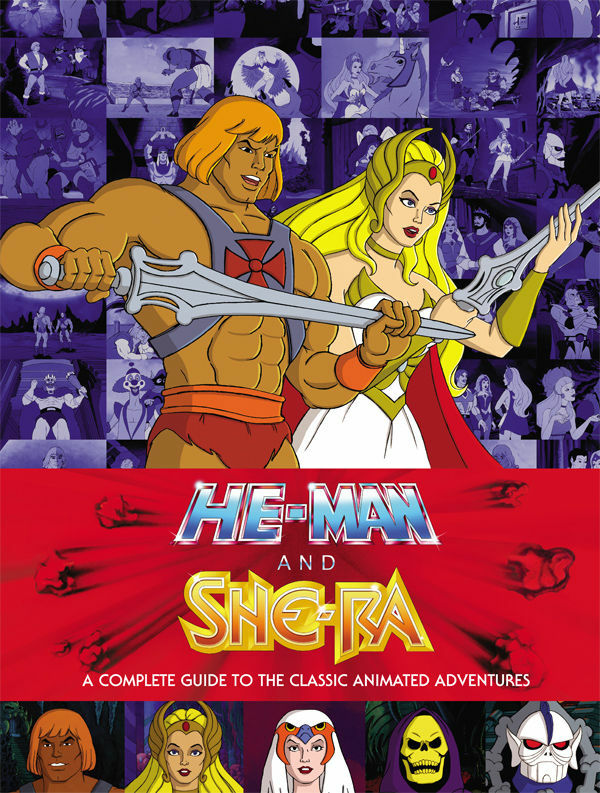 Each episode summary also includes additional information under a variety of headings, including a breakdown of the cast of characters who appear, trivia from the episode, information on any deleted scenes, a “Same/As” category that shows some of the more interesting examples of Filmation’s well documented habit of reusing animation sequences, examples of He-Man showing his amazing power, and also a summary of those amusing moments where Prince Adam would inexplicably unsheathe the Sword of Power and subsequently lose it, creating a whole new secondary plot. And that’s just for starters. There’s so much information packed into this volume that it can initially feel a little daunting about quite where to begin. After all, we’re talking about 223 episodes of He-Man and She-Ra here, along with two specials, a movie and – of course – that Christmas-themed special. Oh, and for an extra dose of excitement, writer James Eatock also includes plot synopsis for abandoned episodes which, for one reason or another, were never actually made. Honestly, if you’re a He-Man fan, I’m not sure I even really need to convince you of just how amazing this collection is. I went in expecting the same lovingly curated collection of trivia and artwork that had been shown in Dark Horse’s previous hardcover collections, but even with my already high expectations, I was absolutely blown away with just how much work James Eatock has put into this. The layouts are clean and crisp, with text and artwork both easy to follow, and concept sketches and storyboards are all recreated in impressively high quality. Eatock shows his insight and exhaustive research throughout, unloading screeds of intriguing trivia alongside classic quotes and – perhaps most importantly – the “moral” at the end of every single issue. The word “essential” is banded about a little too frequently in the world of reviews, and even I’m aware of perhaps using it a little too much myself on occasion. But mark my words, if there was ever a book that should be considered an absolutely essential purchase for any and all He-Man fans, it’s this one. Fascinating, enlightening, packed with nostalgia and infinitely re-readable, this is without a doubt the most powerful He-Man resource in the universe.